A nice way to conceal track and mounting hardware. Use on the back side of curtain fabric, 1/2″ below the rim, folding around the paper thin plastic with arrow hole pointing up and exposing the thick hook channel. Then, sew or staple into place. 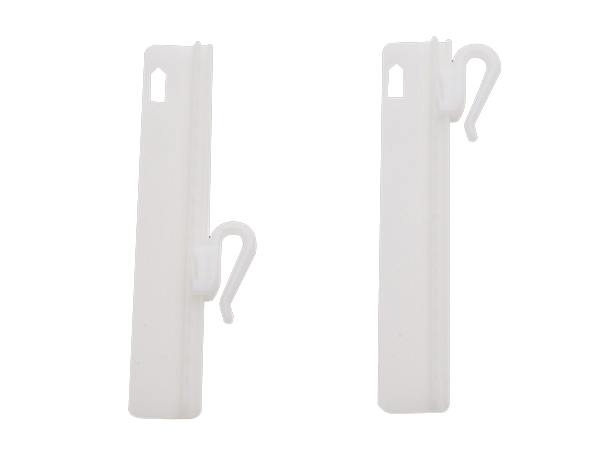 The hook is removable by sliding it downward. Curtain height can be adjusted to max. of 3″. Size: 3-3/4″x 7/12″. Order equal amount of hooks as you would rollers; we recommend 4 rollers per foot of track.